Maia Wolfe (a.k.a. “Wooly,” “Woo-woo,” “Woolvis,” Wolvasaurous” and “the World’s Best Dog” according to the humans who loved her and fed her) enjoyed her last meal Saturday afternoon, took a nap and died a peaceful death. We should all be so well bred, well fed and well loved. Mac and I brought Maia home nearly 14 years ago. She was an Alaskan Husky, bred not for sale, but to pull a sled, by a guy who lived with the pup and 30 of her canine relatives on secluded acreage in Monroe. She was 10-weeks-old when we got her: a Husky-Border Collie mix with a bit of Greyhound thrown in for speed. Which is to say she was very smart and very stubborn: a pack animal who, when she was young enough to do “crazies” — running circles around the yard and the house as fast as she could — would show hints of her Greyhound lineage. 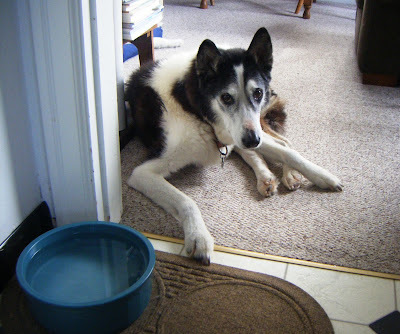 Maia had “two mothers” the sled dog-racer told us. One was her natural mother, the other a lactating aunt. So she had two sources of mother’s milk, of which, we were told, she took great advantage. “She might throw up in the car,” he said as we traded a hundred-dollar bill for the pretty puppy, taking her away from her extended family — and into what would become the bosom of ours. He was right. She never liked riding in the car. But man, that dog loved to eat. “I am not going to feed her from the table!” said Mac, who’d learned his lesson with his last dog, who’d died several months earlier when we were in the early stages of our own relationship. (“A bite for Mac, a bite for Kelsey” was the way he explained mealtime with his other female companion.) And he kept his word: he never fed Maia table scraps. Neither did I. Until, oh, about a month after bringing her home. I was eating a rib off the bone and she was looking at me with those big brown eyes and well, what could I do? She got the bone. And that was the beginning of the end. 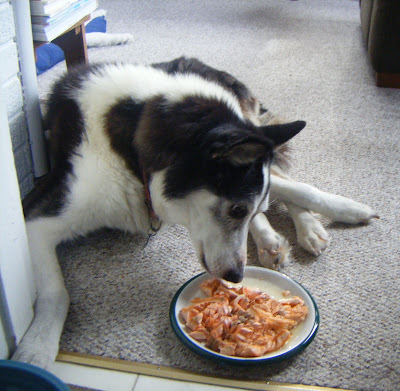 Maia, by then known as “Wooly,” soon became the best-fed dog around. Little did she know that when she left her canine family she’d be headed to a house filled with generous cooks — including one who reviewed restaurants for a living. “May I have a doggie bag, please,” I’d ask waiters all over town. And when I said “doggie bag” I meant it. 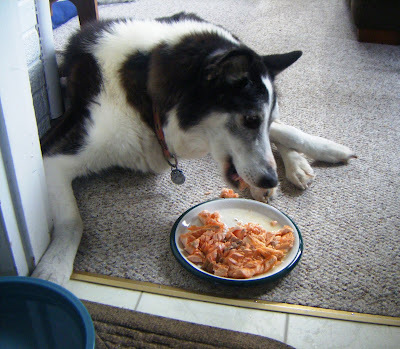 Like me, Wooly ate the kind of food people everywhere dream of: from thick-cut pork chops (she loved the fat) to wild-caught king salmon (her favorite) to slices of (forgive me Paul Mackay) leftover “Steak Troiani” (that signature dish-for-two cost the Seattle Times $85). It’s been years since I brought that leftover beef filet home. And on the rare occasion there was no decent “topping” for her dried chow, there’s been a rare day since when Mac or Nate hasn’t said “What, no Steak Troiani? (speaking for the dog, who would if she could). Meanwhile, Maia would look at me — and the canned dog food atop her Nutro Max — and sneer with distaste before walking away from her bowl. Over the years we’ve amassed more than a few dinner-party tales of Wolvis’ love for fine foods: My favorite is the time Mac roasted a duck and left the meaty carcass on a cutting board in the kitchen. We were enjoying a glass of wine after dinner in the living room when Mac jumped up shouting, “Maia Wolfe!” — later describing how, out of the corner of his eye, he saw her slinking past, on tippy-toes, looking not unlike Wile E. Coyote, with the carcass in her mouth. She beat him to the dog-door and he later pried the thing out of her jaws. But not before she got in a few delicious mouthfuls while dining al fresco. Mac’s favorite is the one where Wooly (as he always describes it) “caused a diversion” one night when we were eating a summer supper of imported cheeses and meats. Nate was sitting in his highchair nearby and she knocked into it. He dropped his baby bottle and in our flurry to pick it up, the dog made off with a hunk of expensive Italian salami. The scent of roast chicken, a Sunday-supper staple in our house, drove her nuts: as a young dog, she regularly stamped her feet while we ate, begging for a bite (she always got one). 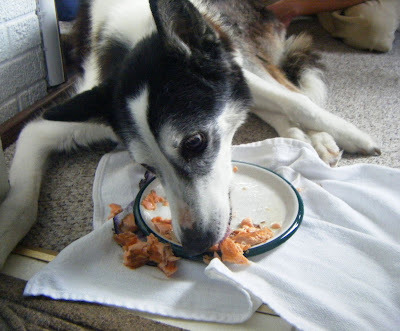 But as she got older Maia grew far more patient — perhaps because she knew I was always good for a bite or three: a slice of ham while packing Nate’s lunch, a sliver of cheese while making my own. I can’t say how sorry I am that she didn’t live another two weeks so that she might have enjoyed her favorite holiday — Thanksgiving. Ever see a Husky smile? That would be Maia Wolfe as I pulled the turkey out of the oven every November. But her smiles have been fewer and fewer over the past months as she struggled with old age, lost so much muscle-tone she could hardly hold up her hindquarters and suffered from incontinence. But the one thing she never lost was her appetite. So, last week, we did what we’ve been dreading having to do: we called our friend the vet, who was kind enough to come over on Saturday to put her out of her misery. But first, I made her dinner. Afterward, she went over to her bed by the door, laid down to take a nap and never got up again. She was one lucky dog, that Maia Wolfe. But not as lucky as we were.